Bridal separates are definitely an option for the unique bride, bridging the gap between fashion and bridal. It was 2014 when we first laid our eyes on bridal separates, fast-forward to 2018 and they are back and more rebellious than ever. Separates are super flattering for all body shapes and are an easy, more personalised alternative to the traditional wedding dress. The below separate pieces are a perfect example of how you can create a boho-bridal look, with your own personal stamp of approval. Create your own combo by mixing and matching a statement top, like our “Roosevelt” crop, with either a skirt, like our floating “Kahlo” skirt, or fitted bridal trousers like our “Joplin” pants. Choosing just one look for your wedding day can be difficult, so why not go for a versatile piece with two looks? When you’re buying your wedding dress you will have to keep in mind both the ceremony and the evening celebrations. Having a versatile gown where you can go from one look during the day, to a different look in the evening, is one way to leave a lasting impression. Opt for a dress which you can wear with an overlay dress or top, which you can take off in the evening for a whole new look. For example the below dress, paired here with a laced crop top, can take your look from beautiful bride-to-be, to the wife of the party. If you’re wanting to make a statement, sleeves are the way to do it! Some might call it the Royal effect following Meghan and Princess Eugenie’s wedding, but sleeves are big trends at bridal fashion week – and they were not limited to just being plain and simple. 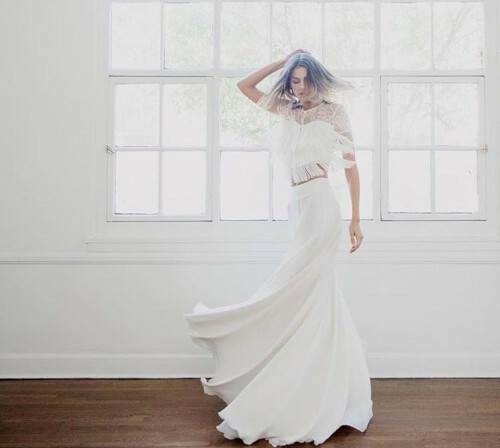 Statement sleeves have been a trend this year in the fashion industry so it is no surprise that statement sleeved wedding dresses have made their way to bridal boutiques. Along with simple sleek royal sleeves we have a statement sleeve suitable for every bride. Some of our brides love the sophisticated design of our batwing “Solaire” or our bishop sleeved “Farou” dress, both by Otaduy. 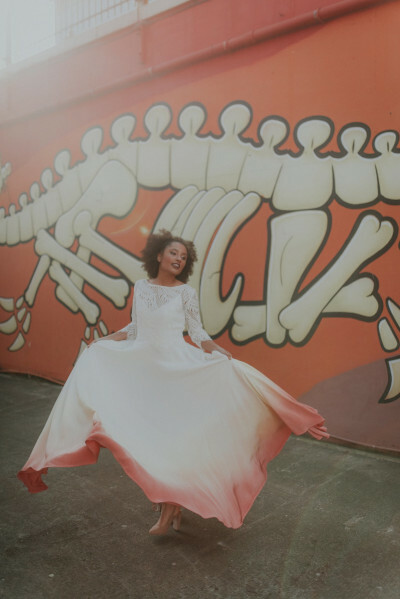 Our brides who would like to look like a true bohemian royal, have opted for our fitting tassled sleeve “London Calling” gown by Lucy Cant Dance. Bridal trousers are the perfect way to rebel against tradition. Being a bride does not have to limit you to only wearing a flouncy wedding dress – oh no! Every year we see more of our brides strutting down the aisle and partying their wedding night away in bridal trousers, looking like an absolute rockstar. Bridal trousers over the years have become an icon for the free-spirited bride who wants to make a bold but chic statement, and they are getting increasingly popular with celebrities, seen on the queens of cool Solange and Amal Clooney. Now it’s your time for you to wear the pants! Our most popular trousers crafted by Otaduy are ready to try on in-store, inspired by the rock ’n’ roll megastar Janice Joplin, they are the most flattering trousers to make a statement in. Would you break tradition and wow with a splash of colour? 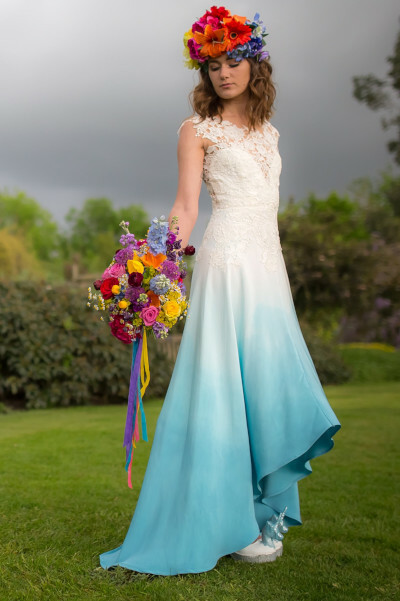 Not all weddings are the same; when you’re planning your wedding, the main goal is to show-off your personality, so why not have a colourful wedding dress too? The latest bridal trend is to have an ivory dress, but with a colourful twist to match with your colour palette. The most sought after style of these vibrant dresses come in dip-dye form like the below. Rock the Frock will be showcasing their unique dresses at The National Wedding Show at Manchester Central on 27-28 October in the Eclectic Boutique!